Most New Yorkers are aware that the state has a cap on local property taxes that has effectively slowed their growth. But few know that residents of a few large cities benefit from a multi-million-dollar infusion of state dollars that limits property taxes, while residents of smaller cities, towns and villages get far less help. Because of this, residents of smaller cities pay a substantial property tax penalty compared with their suburban neighbors, one that residents of Buffalo, Rochester and Syracuse do not pay. Among New York’s 25 most highly taxed municipalities, the State’s $714 million AIM revenue sharing program has a highly variable impact on property tax burdens. Without AIM aid, the property tax on a $150,000 home would be $4,500 in Buffalo and $4,827 in Binghamton. With AIM aid, the Binghamton homeowner would save about a thousand dollars while savings to the owner of a similarly valued home in Buffalo are nearly three times that. Within the Rochester MSA, AIM saved owners of a $150,000 Rochester home $2,043 while Genevans with a comparable home—and a higher tax rate than Rochester without AIM—save only $735. Why should the tax break vary so much? Residents of villages with high tax burdens fared even worse. In Ellenville, the tax on a $150,000 home would have been $4,155.19, but AIM only provided a benefit of $38, bringing the property tax bill down to $4,118. Note the data in this report is from the New York State Comptroller’s Office, Financial Data for Local Governments, 2017. City taxes, except for Rochester, Syracuse and Buffalo are typically far higher than in surrounding suburbs. In the Albany metropolitan area, for example, residents of the City of Albany owning a house valued at the metropolitan area median price would pay $1,788 more than in the neighboring town of Colonie. Schenectady residents pay $2,624 more than in the neighboring Town of Niskayuna. Residents of Utica pay $1,786 more than New Hartford homeowners. In effect, the state’s property tax structure imposes a substantial penalty on people who chose to live in most of its cities. The AIM program provides enough aid to even out disparities in property tax burdens between large cities like Buffalo, Rochester and Syracuse and their surrounding suburbs, but falls far short of providing enough help for smaller cities like Albany, Troy and Geneva. The gap in property tax rates between Rochester, Syracuse and Buffalo and their suburbs is about $2 or less. For most cities, AIM does relatively little to reduce the gap between cities with high tax rates and lower tax rates in towns and villages surrounding them. For most cities the gap is $10 or more – $1,500 on a $150,000 home. The gap between Buffalo’s property tax rate and neighboring towns was $1.22. For neighboring Niagara Falls, the gap was $14.63 per thousand of full value. The gap between Syracuse’s property tax rate and neighboring towns was fifteen cents. For nearby Utica, the gap was $13.48. In a recent post “AIM Aid Needs an Overhaul” in the Beacon, Kent Gardner argues that “We would think that AIM aid would be driven by a formula based on community need. If that’s the case, the formula seems to work poorly.” The existing AIM program reflects a series of past legislative bargains, responding to perceived needs that were identified many years ago that may no longer exist. 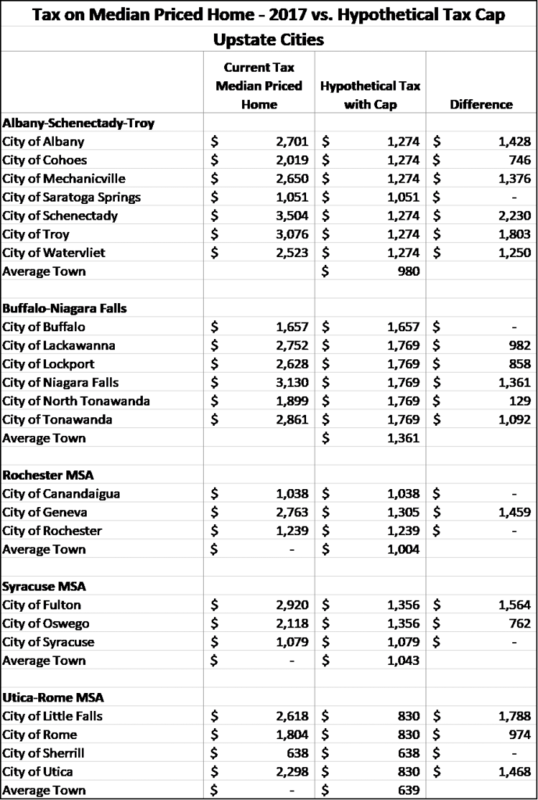 The practice of allocating aid based on a combination of prior program funding and additional criteria results in a jumbled funding pattern. AIM is an important source of revenue for cities. 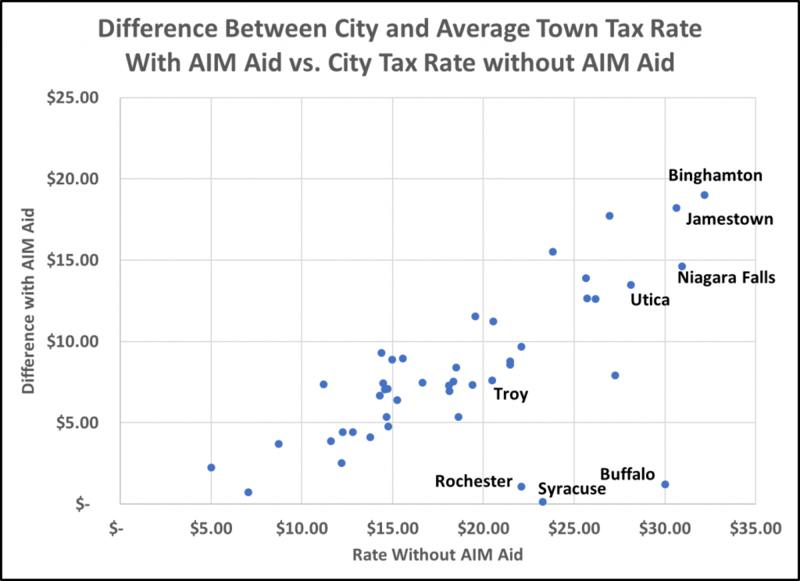 In a few places, particularly large cities like Rochester, Buffalo and Syracuse, state revenue sharing through AIM generates far more revenue than property taxes — in the case of Buffalo and Syracuse, about twice as much. For many others, AIM aid is important, but is a smaller contribution than are local property taxes. In Albany, AIM provides revenues equal to 22% of what local property taxes generate. In Binghamton, AIM generates 25% of what local property taxes provide. For towns and villages, AIM aid is less significant, averaging less than 3% of local property tax revenues. 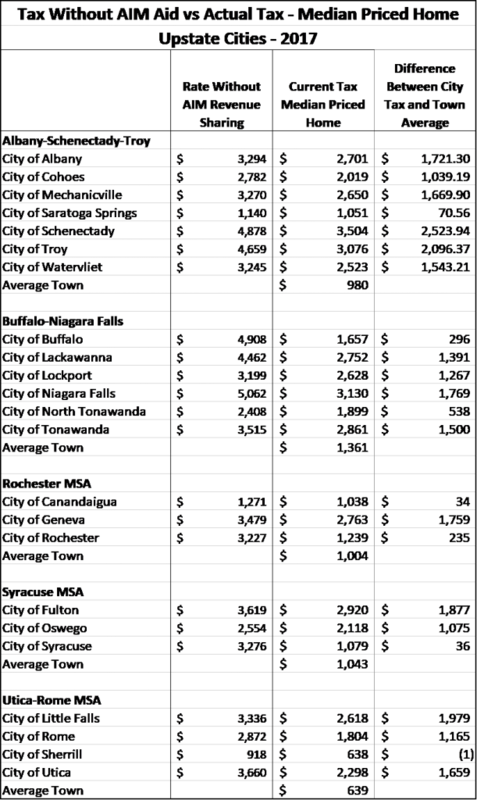 Municipal taxes vary substantially in New York State. 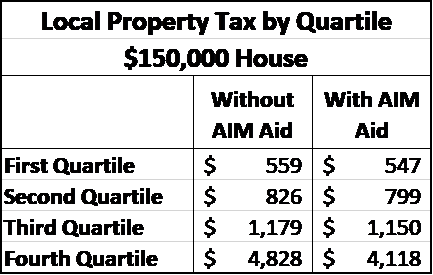 Homeowners in the first quartile paid about $550 in municipal taxes in 2017 (not including school or county taxes). Those in the highest quartile paid about $4,100. AIM revenue sharing aid did reduce taxes in high tax municipalities more than in low tax locations, but the assistance was not large enough to substantially reduce the difference in taxes. Much of the difference in property tax rates between communities reflects regional differences in property values. 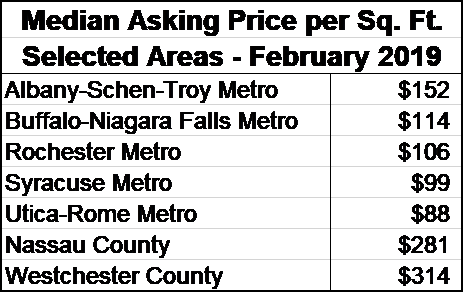 Home values in the Albany-Schenectady-Troy metropolitan area are about 50% higher than those in other metropolitan areas. Values in Nassau and Westchester Counties are about double those in Albany-Schenectady-Troy and triple those in other upstate metros. Because of the large differences in regional housing prices, tax equity between municipalities should be addressed regionally – within counties, rather than statewide. Statewide comparisons overwhelm differences in tax rates within housing markets, distorting our understanding of tax impacts within them. It should be noted that housing prices vary significantly even within counties. City housing prices in most cases are lower than in suburban areas. Property taxes are based on wealth derived from property ownership. But, residents typically pay taxes from their incomes. Median household incomes vary across the state, but not as much as housing prices. 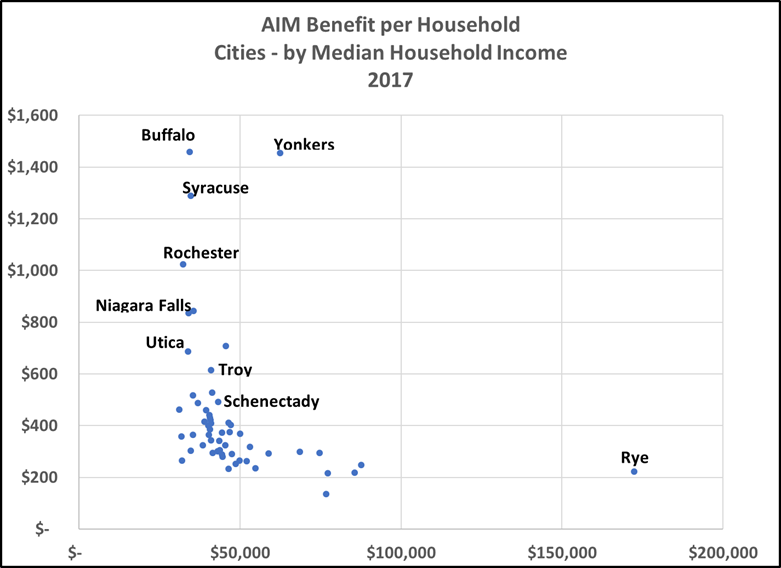 Incomes in Albany-Schenectady-Troy are about 20% higher than in Utica-Rome and Buffalo, and about 13% higher than in Rochester and Syracuse. Household incomes in Nassau County are 60% higher than in Albany-Schenectady-Troy, while incomes in Westchester area about 33% higher. 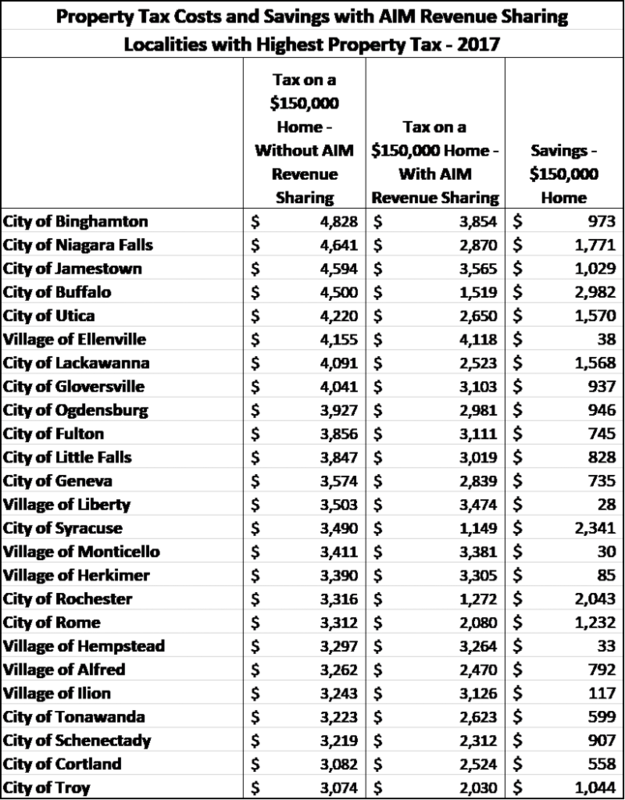 Municipal (City, Village and Town) municipal property taxes per household are similar in Binghamton, Syracuse and Rochester but taxes in Buffalo-Niagara Falls were about 30% higher than in most other upstate metros. Per household municipal property taxes in Nassau and Westchester were about almost twice as has as in most upstate metros. Overall, property tax per resident by cities, towns and villages tracks household income more closely than home values. Within metropolitan areas, the difference in household incomes is much greater than the differences between metros would suggest. In the Rochester metropolitan area, median incomes range from $31,700 in the Village of Penn Yan to $110,544 in the Town of Pittsford. In the Albany-Schenectady-Troy metropolitan area, the range is from $34,495 for the Village of Cobleskill to $105,398 for the Town of Niskayuna. 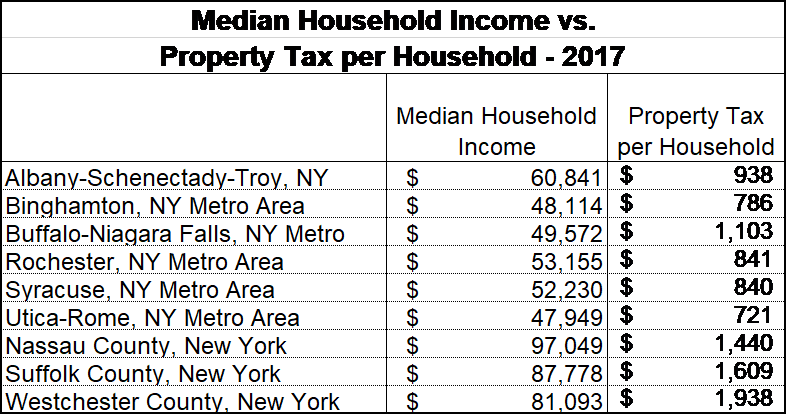 All upstate cities, except for Saratoga Springs had median incomes per household that were lower than the upstate average. But large cities like Buffalo, Yonkers, Rochester, Syracuse get far more than can be justified based on median household income relative to other cities. Although Buffalo, Rochester and Syracuse each have about the same household incomes, Buffalo gets more aid per household ($1,458) than either Rochester ($1,024) or Syracuse ($1,290). Niagara Falls ($835), Lackawanna ($844), Rome ($708), Utica ($686), Troy ($614) and Binghamton ($463) also get less aid per household, despite having similar median household incomes. Jamestown, which is the city with the lowest median household income gets $358 per resident compared to Buffalo’s $1,458, even though its median household income is lower. 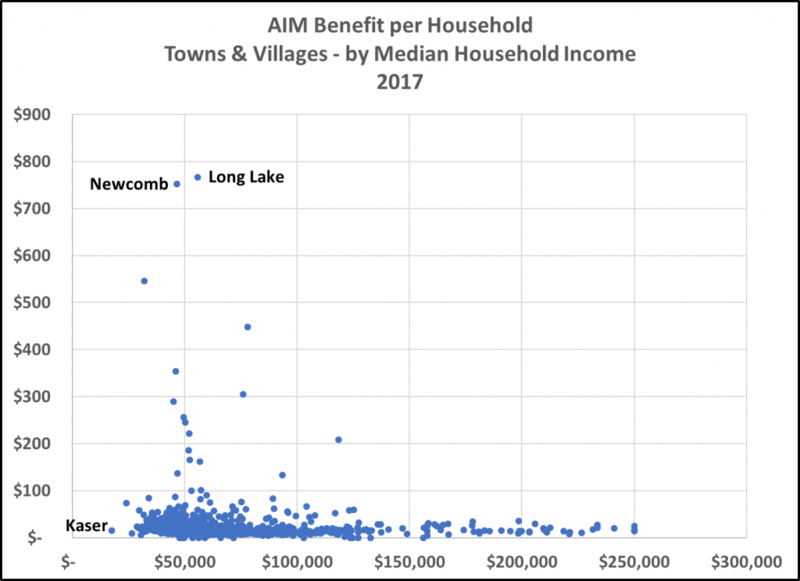 On average, AIM benefits per household were much smaller for villages and towns than for cities, averaging $17 compared with $756 for cities. But, like AIM assistance for cities. AIM assistance for towns and villages with similar median household incomes varied substantially. For example, the Village of Kaser in Rockland County had a median household income of $17,564 and received $17 per household in AIM assistance. Two towns in the Adirondack forest preserve received much more. The Town of Newcomb, with a median household income of $46,500 received $752 for each household, and the Town of Long Lake which had a median household income of $55,795 received $766. Reducing the large disparity in tax rates between cities, towns and villages with high property taxes and those with lower tax rates should be a priority for reform of the current AIM revenue sharing program. Cities have been coping with losses of population for many years. Public concerns about public safety, deteriorating housing stock and school quality as well as racial, ethnic and religious fears can discourage home buyers from considering city locations. Attaching a significant property tax penalty to cities and other high tax municipalities further deters housing consumers. 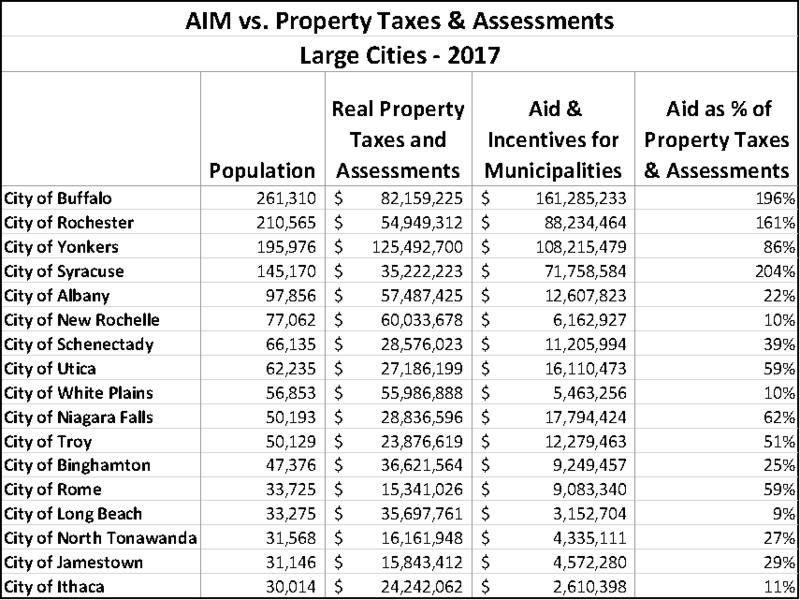 This table compares municipal tax rates for cities and towns (including special districts) in metropolitan areas. It also shows the 2017 municipal property tax based on a median priced home (source: www.zillow.com) in the metropolitan area. (Note that school and county taxes are not included here. Village taxes were also not included because village taxpayers also pay town taxes, which would have made calculations much more complex.) For example, in the Buffalo metropolitan area, the municipal tax on a median priced home in Buffalo, Erie County would have been $296 more than the average for towns in the Burralo-Niagara Falls MSA. But, home owners in smaller cities in the MSA saw much larger differences. Residents in Niagara Falls would have paid $1,868 more, while residents of Tonawanda would have paid $1,598 more than average town residents. To make the state’s AIM revenue sharing program more effective, the State legislature could consider increasing assistance to high tax municipalities. As a hypothetical example, the legislature could provide enough additional revenue sharing aid to reduce the maximum tax rate differential to thirty percent more than the average for towns (including fire districts) within a metropolitan area or county. 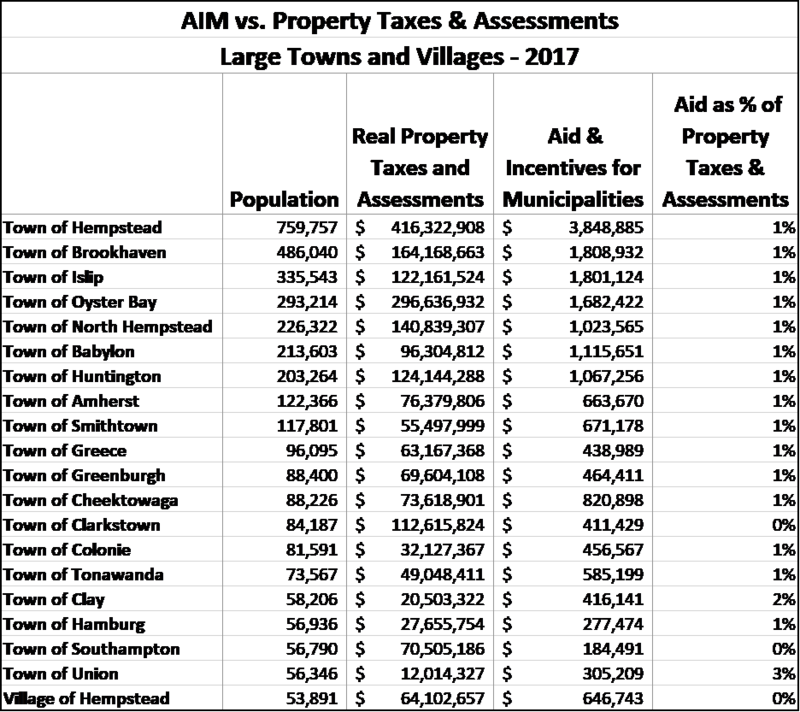 This table shows that increasing AIM aid to ensure that the municipal property tax rate for every locality in a county to no more than 30% more than the average for towns, villages and special districts in a metropolitan area or county would even out the burden on in different localities. The most dramatic case is that of the City of Schenectady, which would see taxes on a median priced home decrease from $3,504 to $1,274. Troy taxpayers would have substantial savings as well – about $1,800 on a median priced home. Utica taxpayers would save nearly $1,500. Again, note that there are variations in median home values within counties. Home values in most cities are lower than in most suburbs. Currently, New York property taxes impose a substantial penalty on residents of municipalities with high taxes. Cities, other than Rochester, Syracuse and Buffalo, face a significant disadvantage in attracting homebuyers because property taxes in cities are typically thousands of dollars higher than in surrounding communities. High property tax rates can reduce home values in a municipality because tax rates factor into their affordability. Remedying the problems with AIM would be simple, though politically difficult. A uniform approach to cities, towns and villages that provides enough funding to reduce the tax penalty for living in high tax cities and other localities to a few hundred dollars for a typical taxpayer would go a long way to resolving the problem. The approach should focus on differentials within housing markets – metropolitan areas or counties, not against statewide averages, since home buyers and owners are primarily interested in tax differentials within the areas that they might consider choosing. The cost of making AIM more effective would be $510 million. But the important point is that an effective revenue sharing reform would not add to overall state and local spending. Instead, by reducing local tax bills and moving costs to the state, it would even out tax burdens paid by residents for local government services. $510 million is a significant amount of money for state government to raise. But the cost should be viewed in context. Last year, state school aid increased by $995 million. And, a reform to AIM need not be implemented all at once. Instead, it could be introduced gradually. The State’s AIM revenue sharing does not address another large inequality that results from local government reliance on property taxes to pay the cost of local services. Because property taxes tax the value of homes and other real property in a community, they do not reflect ability to pay, which, for households, depends on income. Because there are large income variations within every municipality in the state, some homeowners face a substantial burden in paying property tax bills. The state does offer one program, the STAR tax credit, that provides property tax relief to homeowners. The program has one income sensitive element, available only to seniors, that provides additional assistance to homeowners with incomes below $86,300. Additionally, homeowners who itemize deductions receive larger deductions if they have larger property tax bills. But the state could consider additional mechanisms to aid low income householders with high property tax burdens by extending property tax deductions to non-itemizers or by structuring the STAR tax credit to be more progressive.